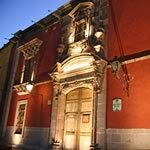 The architecture of San Miguel de Allende is one of its principal treats. 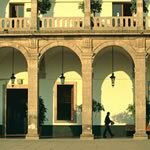 Here you can see countless examples of the elements that make Mexican colonial architecture so enchanting and seductive. Because the architecture of San Miguel is so valued there are strict limitations on what can be built in the center of the city. All new buildings and all renovations must retain the colonial characteristics. Also, to maintain the charm that won the city recognition as a National Monument, there can be no traffic lights, stop signs, billboards or neon signs in the city center. These restrictions ensure that the downtown will remain a feast for the eyes. exuberant and magical. Many old houses have elaborately carved wood doors and clever door knockers. Doors and windows are surrounded by cantera stonework (often pink or green-gray) or sculptured plaster and mortar. Often added to heighten the street-front appeal are wrought iron grillwork and railings, carved gargoyles and niches, which often contain a patron saint or another piece of sculpture. 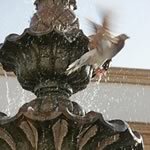 Fountains: Most Mexicans wouldn’t feel a building is complete without a fountain to delight two senses—seeing and hearing. A fountain may be multi-tiered, standing alone in a garden, or built into a wall with a sculptured animal or cherub dispensing the water stream. "Tejas": Many roofs, especially over patios, are made from the terra-cotta half-round tiles, known as “tejas,” that blend so well with the vibrant colors of walls and facades. Ceilings: Common in many Colonial homes are “boveda” ceilings, a type of vaulted brick ceiling that originated with the Mayans, who were extraordinary builders. Shells: Many exterior and interior walls feature inverted cockle shells, which have become, to some, an emblem of San Miguel. Catholic friars incorporated the cockle shells, originally a symbol of St. James, into architecture where ever they spread the word. Columns: Made of concrete, brick, adobe, wood or carved cantera, pillars holding up patios and balconies give a building a sense of drama. colonial period feature an all-important courtyard, the traditional center of the home that the delicious year-round climate makes possible. The courtyard allows Mexican families a relationship with the outdoors while maintaining their privacy. Most courtyards are lined on at least one side by portales, covered spaces—usually separated from the courtyard gardens by archways that serve as the buffer between outside and in. The portales, normally furnished, are key spaces for entertaining guests. How to See the City’s Best: House & Garden Tour. 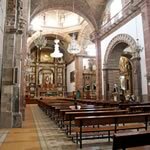 Every Sunday you can get a glimpse inside some of San Miguel’s most beautiful homes. Tour departs at noon from the Biblioteca Publica, Insurgentes #25 (between Reloj and Hidalgo); 152-4987. Proceeds from ticket sales benefit the Biblioteca’s educational charity. 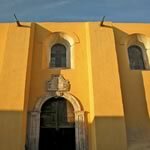 17th century on the main square, the façade of the church was totally renovated in the 1870s by Zeferino Gutierrez, a self-educated stonemason who found his inspiration in picture-postcard reproductions of European churches. 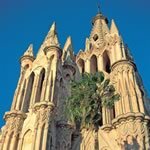 The pink-stone Gothic spires are visible from almost any point in the city, making it the primary landmark in San Miguel and one of the most famous churches in Mexico. A statue of St. Michael the Archangel, namesake of both town and church, adorns the main altar. Casa del Mayorazgo de la Canal: Canal #4. Typical of the colonial era, this imposing building on the main square was constructed by a wealthy 18th-century mining family. It is now home to a branch of Banamex and the interior can be viewed during banking hours. Temporary exhibits are frequently held here. of different tastes of the times. The façade is stone block and churrigueresque (ultra Baroque) and features carved stone figures and tapering columns. The neo-classical blue-and-white tiled dome and bell tower were added in 1799 and thought to be the work of renown colonial architect Francisco Tresguerras. El Oratorio de San Felipe Neri: corner of Insurgentes and Loreto. This church, which was begun in the 18th century, is notable for its numerous domes of differing size and shape. The south-facing emtrance is constructed in ornate Baroque style.